This year our marketing activity will focus on one of the areas that make us really good at what we do – we treat people like people! 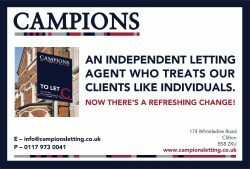 Whether you’re a landlord, a tenant or a contractor, our aim is to make sure that anyone who has contact with our business is treated like an individual. Landlords don’t get an off the shelf approach to letting and managing their property, tenants don’t get an agent who treats them like a number and the majority of our contractors have worked with us for years and are almost part of the family. Hopefully our new campaign will help to spread the word about the way we work!